YouTube offers something for everyone. If you are interested in music, you can find music videos that you like, if you are a food lover, you can access videos related to this niche, and if you are interested in fashion, there are many global channels you can see to know about latest fashions, trends and beyond. 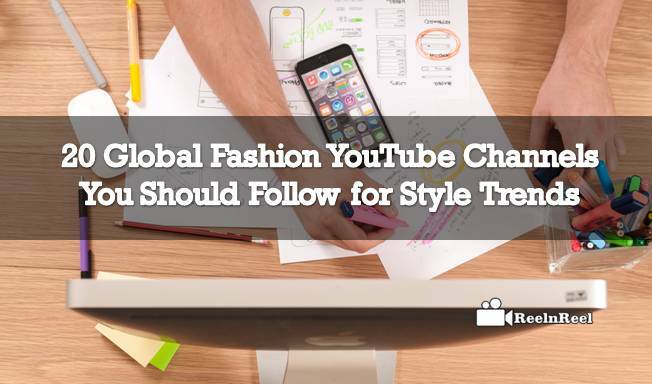 Here is a list of top fashion YouTube channels fashion lovers must follow. 1. Hey, Claire YouTube channel creator is Claire Marshall, follow her videos for getting information about women’s fashion and the videos are entertaining too. 2. Jair Woo creates videos on styling, fashion etc and her videos are interesting and enlightening. 3. Chriselle Lim has one of the popular YouTube channels for fashion. She offers original content and being in the fashion industry from years; she provides her expertise in style, career, beauty, etc. Her channel name is The Chriselle Factor. 4. The Gentleman’s Cove is a YouTube channel run by Jordan O’Brien, and you get to see informative reviews on style and fashion, and he also promoted products that are affordable. 5. Vagabond youth is another fashion YouTube channel that provides updates about lifestyle and fashion. 6. I’m Drew Scott is another fashion YouTube channel run by Drew Scott. He shares tips on style, fashion, etc. 7. Samantha Maria runs a YouTube channel by the same name, and she is a fashion styling graduate from London. She creates videos on makeup, outfits, products, etc. 8. Tim Bryan fashion YouTube is the place to know about style tips and to watch tutorials. 9. Arika Sato also runs a fashion YouTube channel named after her own name. want to know about comfortable streetwear, follow her on YouTube. 10. Becca Rose runs YouTube fashion channel and she is loved by her subscribers. 11. Follow Dre Drexler on YouTube to get advice on fashion. 12. Anantasjia Louise runs a fashion YouTube channel by name La Madelynn. 13. Dulce Candy creates videos on makeup, hair, fashion needs etc. her videos are fun and energetic. 14. Beauty Bitten channel is run by Anne and users follow her to find fashion, beauty and do it yourself needs. 15. Zoella YouTube channel is another fashion channel that can be followed, and it has more than 4.5 million subscribers already. 16. Beauty Crush YouTube channel is run by Sammi Maria. She is a fashion graduate from London. Follow here to know everything about fashion and beauty. 17. Juicy Star 07, this is the YouTube fashion channel run by Blair Fowler. Follow her to know the tips about styling and fashion. 18. Casey Holmes offers videos that give tips to the users on how to look good and what to wear for the perfect look. 19. All Things Fabulous 101 YouTube channel is run by Asia. She creates video content related to fashion, beauty, makeup and so on. 20. Follow Carli Bybel on The Beauty Bybel YouTube channel. She creates videos about the latest trends in fashion and also in beauty. Fashion videos have come a long way on YouTube. Most YouTube channels have subscribers in millions. There are very few people who do not love the fashion videos and fashion magazines. But it is a great experience watching the fashion unfolding in front of the eyes. What is Cloud DVR ?